A malty smell floats through the air when Marc Andries opens the fermentation barrel. “Any minute now this will be a fresh, foaming beer,” he says. Marc takes us to the brewing room. Well, ‘room’... An area the size of a garage is packed with shining barrels and pipes. 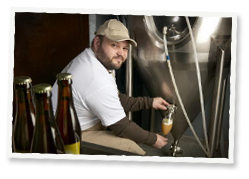 “Every other week, I brew about 500 litres of beer in this room,” Marc says. He picks up a little jar of unknown contents. “Everything starts with this. Smell.” Roos inhales the aroma. “Grain?” she guesses. “Germinated barley or malt,” Marc corrects her. “The most important beer ingredient.” The brewer describes how he makes beer from malt, hops, sugar and water. The more he talks about his passion, the more his eyes sparkle, and: the thirstier we get. And finally, the moment has arrived. “Time for a tasting”, calls Marc. And soon after, we raise our glasses. Marc awaits our reactions. “And? Is it good?” he asks. “This goes down quite easily,” Tom beams. Els laughs. “Sure, this isn’t hard to drink.” Everyone agrees: it tastes like more. We start another round and Marc brings snacks. These aren’t any appetizers: the very best regional artisanal products appear on the table. Butcher’s shop Vangramberen in Boutersem gladly offers his ‘Pietermannenworst’ (a type of sausage) and ‘Schelmenrollen’ (spicy beef and pork meat). A farm in Zoutleeuw, De Potterkaashoeve, provides sheep's-milk cheese. “I prefer the beer in my glass, instead of on a piece of cheese,” Klaas laughs. He holds up his empty glass. Has this story made you thirsty? A degustation of Kessel Blond is heartily recommended. You can make it into a day trip: combine the brewery visit with a trip to art city Leuven, the Provincial Domain Kessel-Lo or the Abbey in Vlierbeek. In Holsbeek, you will find beautiful walking and bicycle trails. The castle in Horst is always worth a visit. Reason enough to get thirsty. Cheers! Visit the brewery, a unique experience! The visit starts with the tasting of a Gulden Delle in our pub. 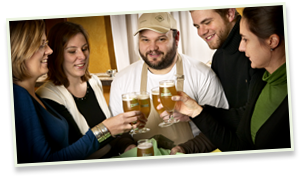 Marc will initiate you into the art of brewing and give you a tour of the brewery. Pictures of the production process will help you understand how the beer is made. You can get to know the ingredients we use to make our brew. 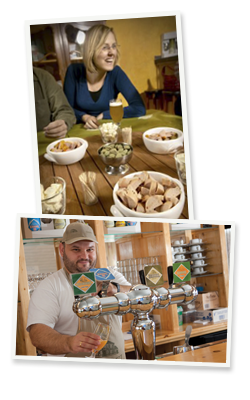 After the tour, our different beers can be tasted in the tasting room. Lovely local delicacies are served with the beverages. Groups of max. 12 people can visit the brewery on appointment. Stroobants Coffee from Diest, with Damiaan speculoos biscuits from Den Trommel in Tremelo. Butcher’s shop De Kapblok uses malt from Kessel Blond and Kessel 69 in its Metteköu meatballs. We also serve cheese from de Ploeg in Ramsel.